Below is a news release quoted fully. 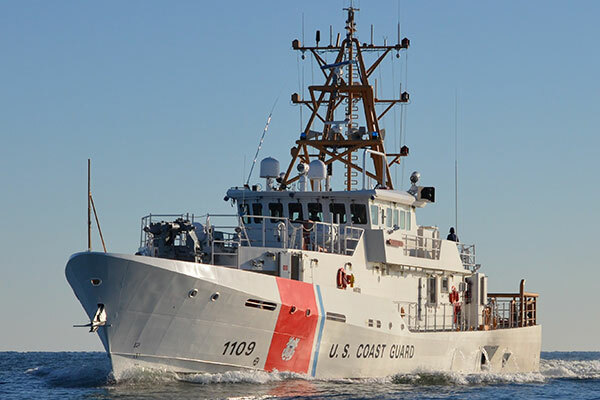 “US Coast Guard to base 2 new cutters in Astoria, Oregon” (sent 04/28/2017 04:31 PM EDT) Note this will happen “starting in 2021.” My estimate is, the first WPC going to Astoria will be FRC #42 give or take one or two numbers. If so, the first Astoria based WPC will probably be funded in FY2017. This news release may have been intended to asssure the Oregon Congressional delegation that they would be getting some benefit from the FY2017 CG budget. I have only seen definite homeports for ships through #23. There are 18 in D7 (six in Miami, six in Key West, and six in Puerto Rico), two in Cape May, two will be in Ketchikan, and one in Pascagoula. That leaves 35. I’ve seen indication we will have three in Apra. If we put three in San Pedro and two in Atlantic Beach (only a guesstamate) that only takes us to #34, with 24 still to allocate. This entry was posted in FRC, WPC by Chuck Hill. Bookmark the permalink. Thanks to Dan D. for bringing this to my attention. Webber class WPC #25 commissioned in New Orleans. To be homeported in Pascagoula, MS.